Shots rang out at West 35th Street and Eighth Avenue at about 6:15 a.m. after an argument inside the fast food restaurant, according to NYPD Chief of Detectives Robert Boyce. The three victims were in the McDonald's when they began arguing with a heavyset man, Boyce said. The victims went to the subway station nearby and were followed by the heavyset man, who opened fire. The man who died, 43, was shot in the neck, Boyce said. He was pronounced dead at the bottom of the stairs in the subway. One of the other two men was shot in the neck and stomach and is in critical condition, while the third man was shot in the leg. The third man is expected to survive. 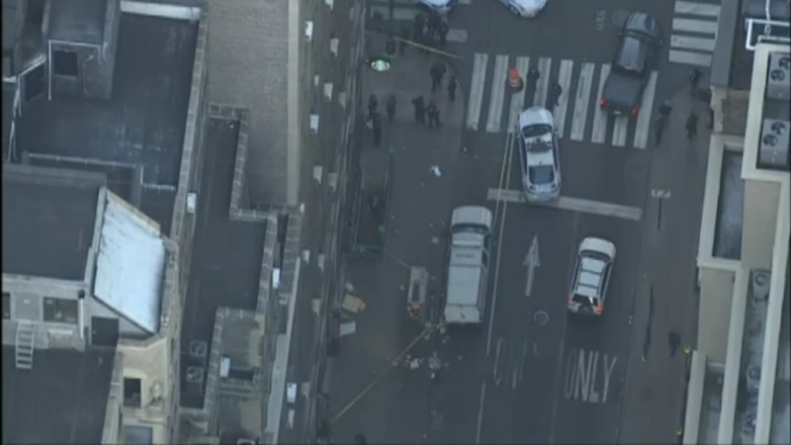 A man who identified himself as the brother of one of the victims told NBC 4 New York told NBC 4 New York that the three victims were coaxed out of the McDonald's before the shooting. A law enforcement official told the Associated Press that all three victims had long records of mostly drug-related arrests. Two men who attend a nearby methadone program at the West Midtown Medical Group said they knew two of the victims, the one who was killed and one who was injured. They said both victims came to the clinic for years and that they would get breakfast before going to the clinic later in the morning. Police said they could not immediately confirm that to the Associated Press. A security guard said no official at the clinic was available to comment early Monday. Police closed off 35th Street between Seventh and Eighth avenues. Detectives were interviewing people at a McDonald's near the subway entrance, where a cane could be seen resting on the top steps. Investigators also were interviewing officials and patients at a methadone clinic a half-block away from the crime scene.